A death row dogs final thoughts ... We wait in the shelters, our shadow is our only friend. We are not quite sure why we are here, not quite sure about the end. People seem to forget us, no one has called us by our real names - they named me Floyd. There's no familiar face here, each day is the same. Is there anybody out there? We are not allowed to stay here long. Maybe some day you will stop by the shelter and see all the dogs and cats that are about to lose their lives like me. Floyd can be found resting in his kennel. He looks around at everyone with sad eyes, hoping they will give him some TLC. He is a bit shy and needs your help warming up. Will you be his hero? Floyd is around 2 years old and weigh about 40-45 lbs. 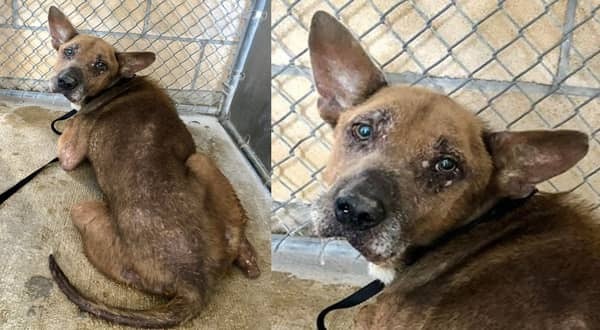 Fidonation, if you or someone you know is interested in giving this pup the forever family he rightfully deserves, please contact the San Antonio Animal Care Services, and reference the shelter ID #A500249. 4 Responses to "VERY URGENT! I was given another chance to live. But still, nobody wants me"
My name is Lin Kristian and I just made that comment that says unknown!